Rory Kinnear’s portrayal of Hamlet in the 2010 production at The National Theatre is considered by many of the theatrical great and good to be a generation defining portrayal of the Great Dane. It was the National’s former artistic director Nicholas Hytner’s first time directing Shakespeare’s most famous play. His Denmark is a modern dress production set in a surveillance state. The Independent’s David Lister called it , “a chilling production that demanded to be seen”. He said, “A great Hamlet is not only a Hamlet of this time, it can be a Hamlet that defines his time”. “Kinnear shows a Hamlet whose depression can be seen in fits of unwarranted aggression, withdrawal, manic high pitched laughter, intense unhappiness or simply desperate attempts to make sense of anything “. He won the 2010 Evening Standard Sward for his portrayal. He was praised for a his, “bold reinvention of the Dane”. Lister makes special mention of Clare Higgins, “revelatory Gertrude… predicatably, the marvellous actress redefines the role. Gone is the weak, lovestruck pliable and guilt ridden mother and wife. This is more realistically a woman who will have a drink when it suits her, is more than capable of barking out orders herself and knows exactly what she wants out of life”. 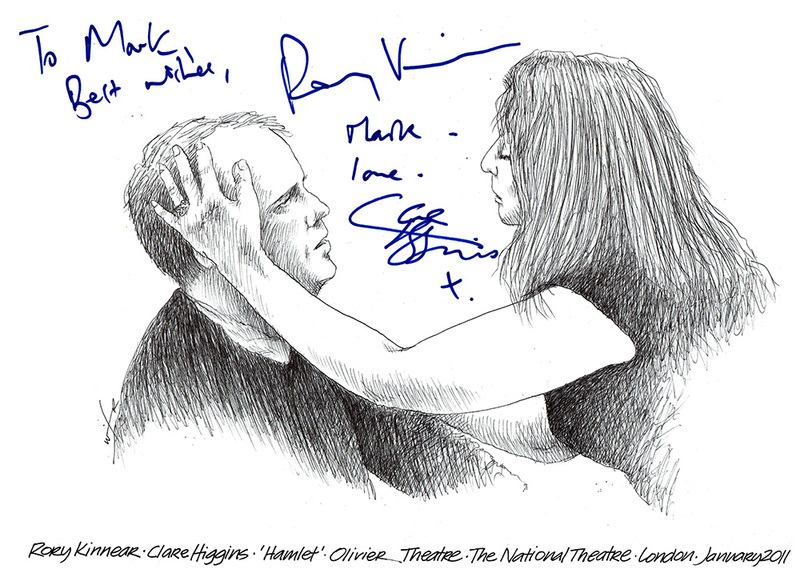 Not always an easy place to catch cast members, given the many exits available at the National Theatre, I was very fortunate to catch both Rory and Clare who loved the sketch and were more than happy to ‘graph it for me. This entry was posted in Celebrity, Theatre and tagged Clare Higgins, Hamlet, Rory Kinnear, Shakespeare, the national theatre by Mark Winter / Chicane. Bookmark the permalink. Love the energy of the interaction and the interesting negative space of this piece! Thanks, the ‘drama’ is always fun to draw!